Our whole Centurion office participated in this initiative. We divided into teams to accomplish our task. Team one repainted the paw prints on the path ways. Team two cleaned up the garden and planted new flowers, decorated the area by placing ornaments between plants and trimming the shrubbery. Team three worked on repairing the sprinkler system to ensure that the garden can be easily maintained. In between our gardening we had the opportunity to spend time with the animals by taking the dogs for walks and sitting with the cats in their cosy kennels. Each employee donated R60 to enable us to buy 67 cans of dog food and 67 cans of cat food.?? Jo-ann from the SPCA took us on a tour to show us how they operate on a daily basis and what they are planning for the future. They built an animal hospital and put roofs over the animals' heads by selling all the donated items (clothing, kitchen appliances etc) that are sent to them. The hospital is now fully equiped with state of the art equipment that was donated to them.? Paul Greyling donated ? The Centurion SPCA is also now able to assist in helping animals from other branches with their new "hospital"?. Paul Greyling, our principal, donated the costs for setting up the network and wiring of the printer.? In the near future they want to extend the kennels to al?l?ow the ?cats to be in the sun as well as to be kept dry. The dogs get rotated every fourth day to spend time in the "day run kennels" which is outside and a much bigger area to allow them some freedom. They currently have 6 day run kennels and are working towards adding another 30.? 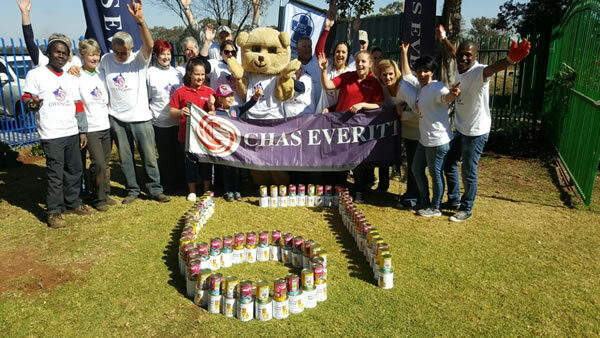 "We had so much fun, and found our "cause for paws" for Mandela day, as a great team building experience! This once again served to prove that by doing good made us all feel good, and seeing how all our donations are put to use is just incredible! The donations from the public is still coming in strong, we received 3 more bags of dog food, tins of food etc yesterday from people who saw our posts."